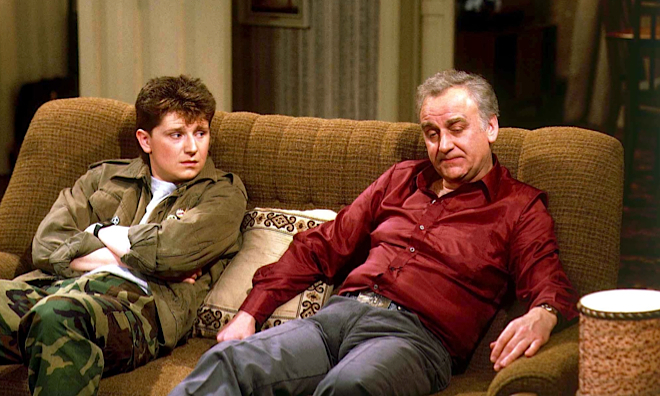 GOLD STANDARD mid-evening goofery with none-more-80s “sit” involving a grumpy JOHN THAW having to put up with layabout son REECE DINSDALE singularly failing to find his own place and regularly succeeding in thwarting his old man’s quest for a nice bit of peace and quiet. Stellar opening sequence saw big on-screen title letters “flying” over London city-scape a la WOGAN to a nifty electro-fied version of ‘Consider Yourself’ (all slap bass and wah wah brass). Instant cut to the cheapest, dirtiest and sparsest of all ITV sitcom sets confirmed suspicion that all the money had been spent on the titles, but no matter. Every episode revolved around John getting irked by Reece bringing home a) a new girlfriend b) a new hairstyle c) a new obsession such as learning to drive or acting; followed John getting to really rather appreciate the merits of a), b) and c) so long as they’re not too loud and don’t spoil his bergonias; followed by Reece taking umbrage and storming out; followed by John feeling guilty and confiding in busybody cleaner Enid; followed by one or other holding some kind of party/gathering in the house to which the other isn’t invited but shows up anyway; followed by the pair sitting at opposite ends of the sofa at the end of the night trading coy insults; followed by John pulling a will-he-never-learn face and going to bed. Repetition was the key, making for endlessly reassuring, dependable suburbacom.